Welcome, Beadphoria friends! Summer has officially begun, so today I want to share with you a necklace that will be the perfect accent to any summer outfit. 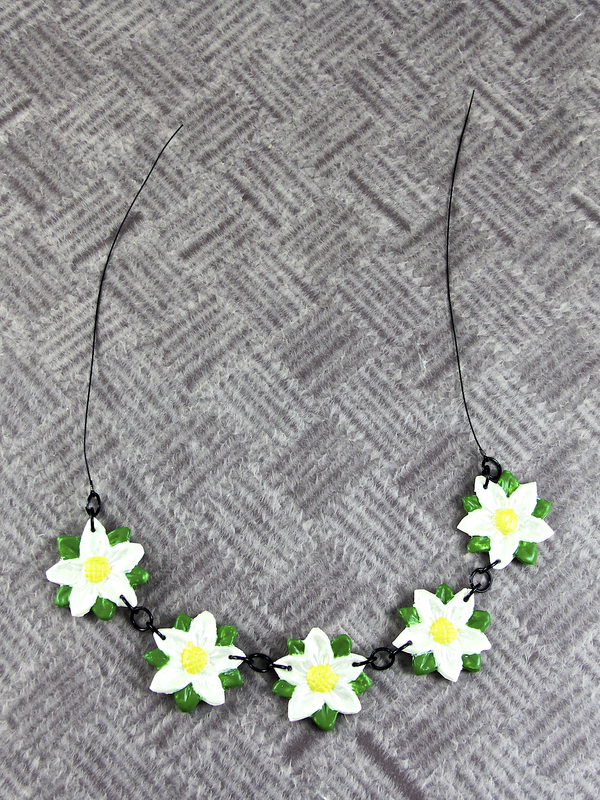 The Makin’s Clay Daisy Chain Necklace is easy and fun to make. The Makin’s Clay is especially effortless to work with. You definitly don’t want something heavy around your neck in the summer heat, and the Makin’s Clay pieces are so light weight, you barley notice you are wearing the piece. Like many of you, I am all about craft materials that are simple to work with. The push molds worked great every time. I also liked that all I needed to cut the pieces out after molding was a pair of scissors. 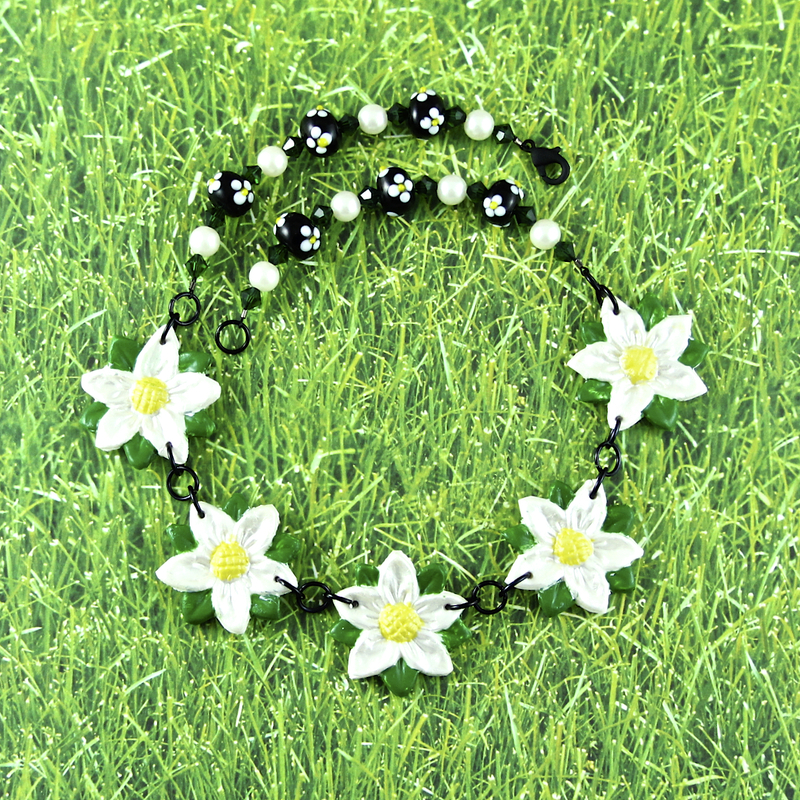 Ready to make your own Daisy Chain Necklace? Read the instructions below to find out how! 1. Make 5 – 1.5 inch balls of clay. 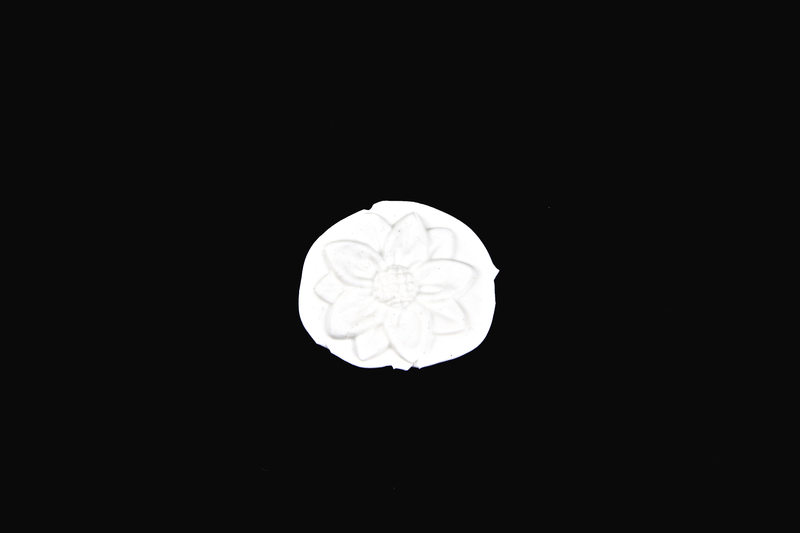 Press each one of these into the daisy shape in the Floral Mold. Allow your molds to dry overnight. 2. 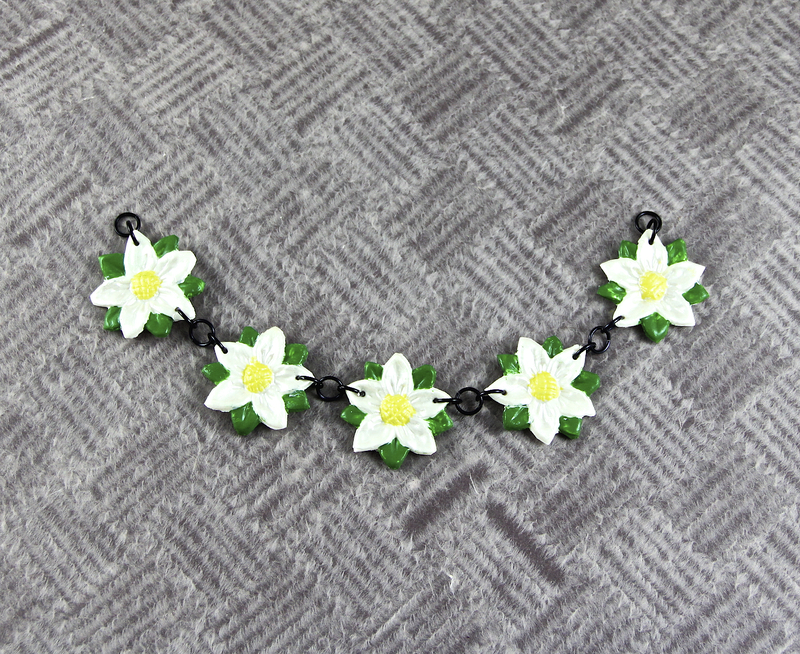 Once the daisies are dry, cut away excess clay using scissors. 3. 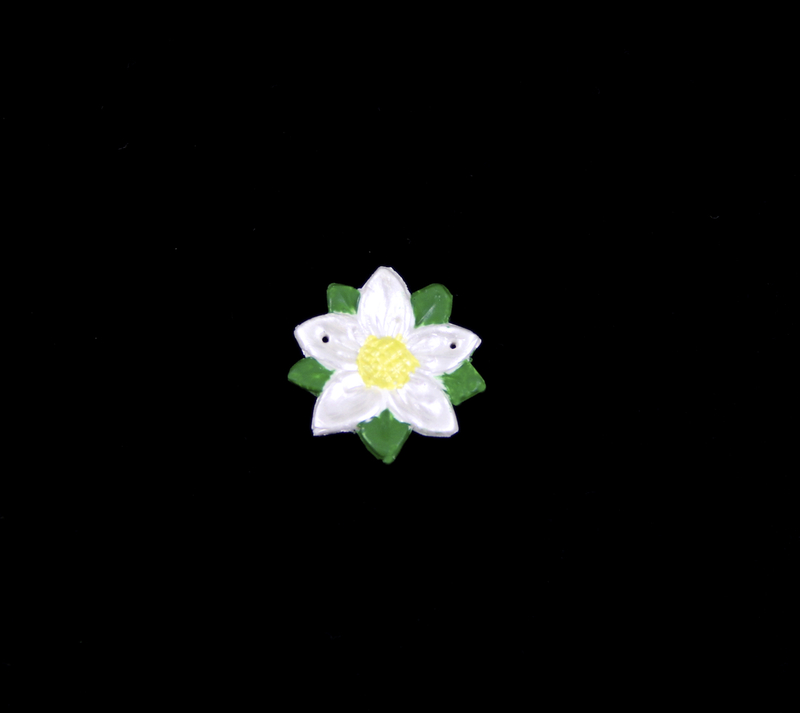 Paint your daisy using the Ducking color in the center, the Mother of Pearl for the petals, and the Real Green for the leaves. 4. After your paint has dried, use your hole punch pliers to make holes in the top outer petals on all of your daisy components. 5. 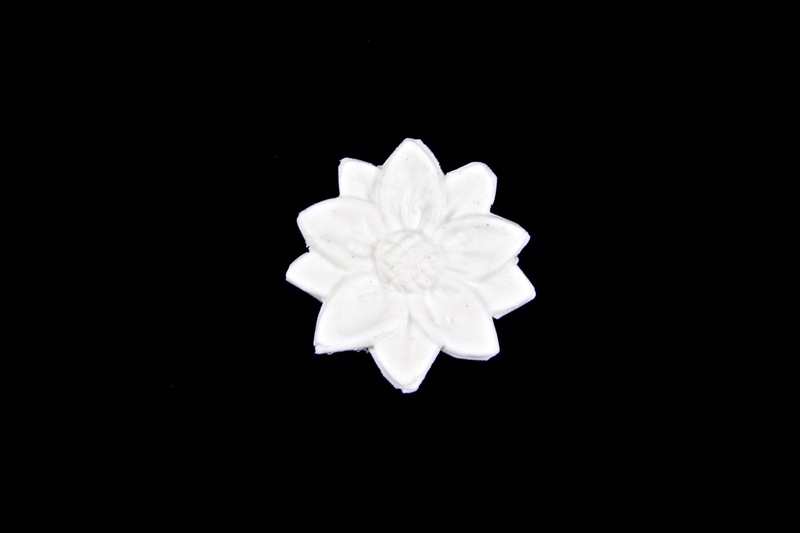 Insert a jump ring into the hole on each of the petals on all of your daisy components. Link your components by using the additional jump rings. Add jump rings to the ends of your last two components. 6. Attach 6 inches of beading wire to each side of your linked daisies using 2 of your gunmetal crimps. Tip: If you don’t have gunmetal crimps, use silver crimps and use a black paint pen to cover them. You can also do this if you are unable to find a black clasp. 7. 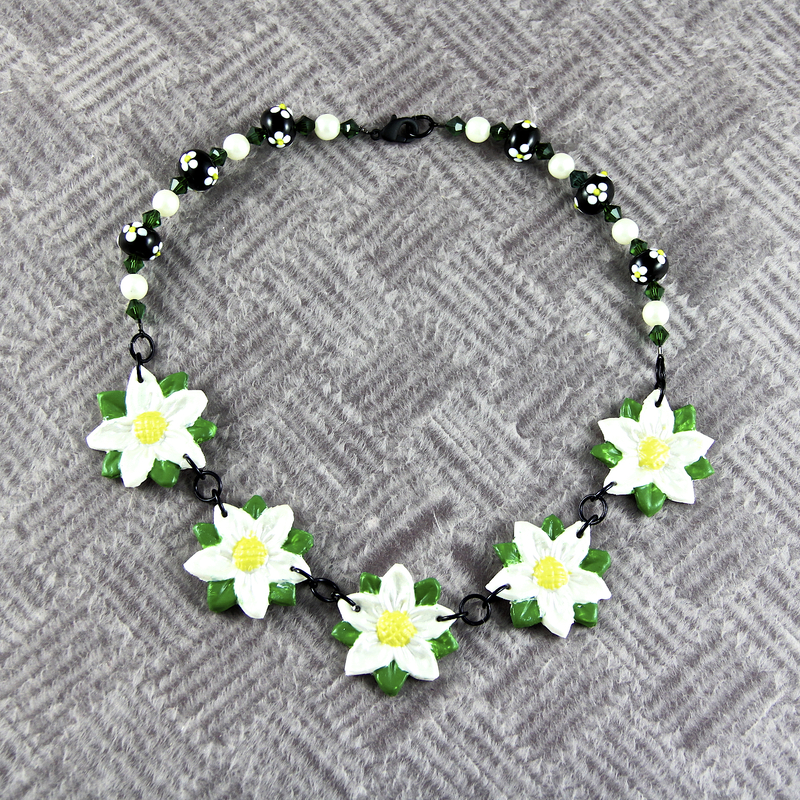 String on one Emerald Swarovski Crystal, one pearl, one Emerald Swarovski Crystal, one daisy lampwork bead. Continue pattern until you finish with one pearl and one Emerald Swarovski Crystal. Attach one half of your clasp. Repeat pattern on other side to finish your necklace. 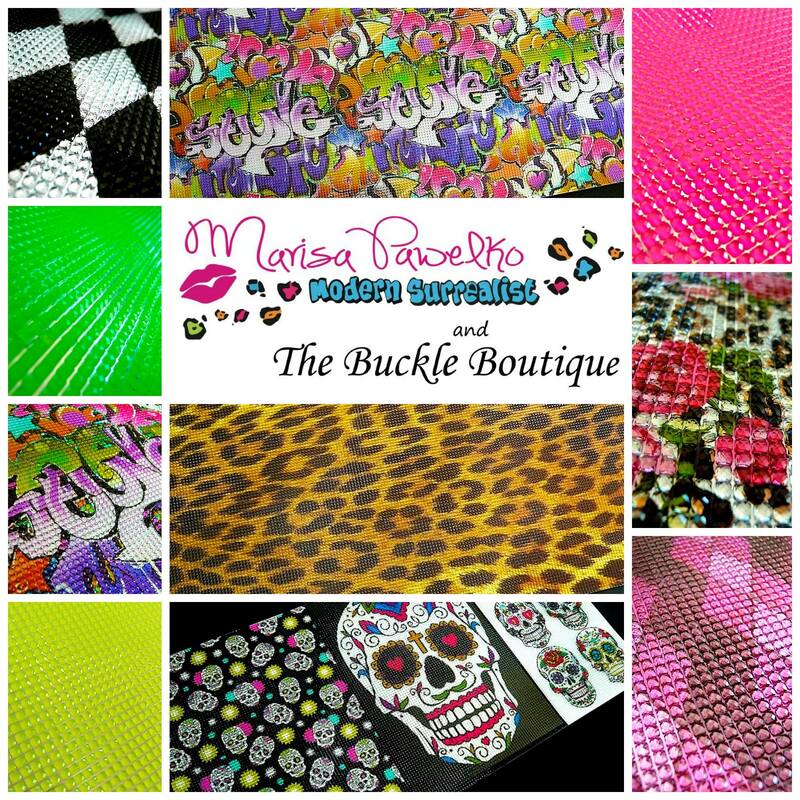 Welcome to the Buckle Boutique Blog Hop for Marisa Pawelko’s fabulous line of rhinestone sticker sheets! When my friend Marisa offered me the chance to work with her new line of rhinestone sticker sheets, I was so excited! The colors in the line are absolutely fabulous. Want to make your own? Here’s how! !. 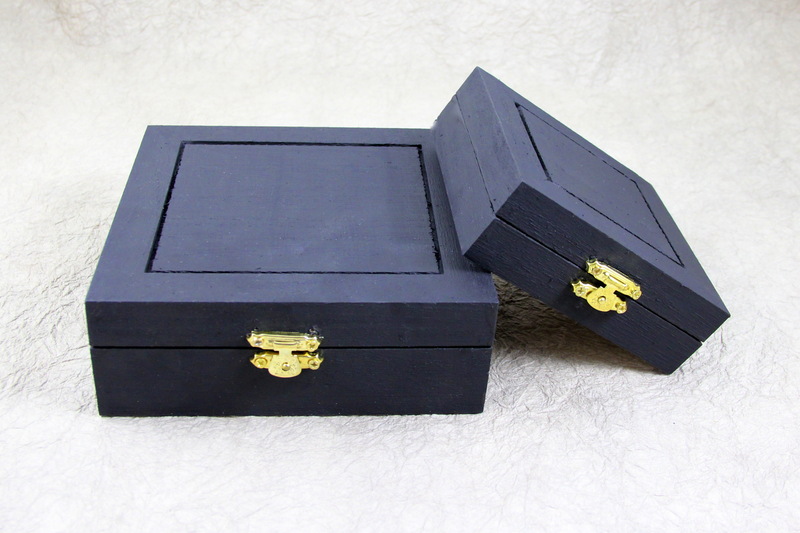 Paint wooden boxes black with acrylic paint, both inside and out. 2. Measure the center of the top of the box and cut square in desired pattern. 3. Remove backing from the Rhinestone Sticker Sheet and apply to box. 4. Measure the outer square and cut panels to cover the outer rim. Cut sections to cover from a different pattern of the Boudoir Quad. 6. Measure the sides of the box and cut panels to cover the sides from the same pattern used to cover the outer rim of top of the box. 2. Using your cutters, cut one large circle, 4 medium circles, and 6 small circles. Allow to dry overnight. 3. Then, using your cutters as a template, trace a large circle on the roses section, four pink diamonds with your medium cutter on the pink diamond sections, and 4 larger lips and 2 smaller lips with your small cutter on the lip section. Cut out all of your circles using your scissors. 4. 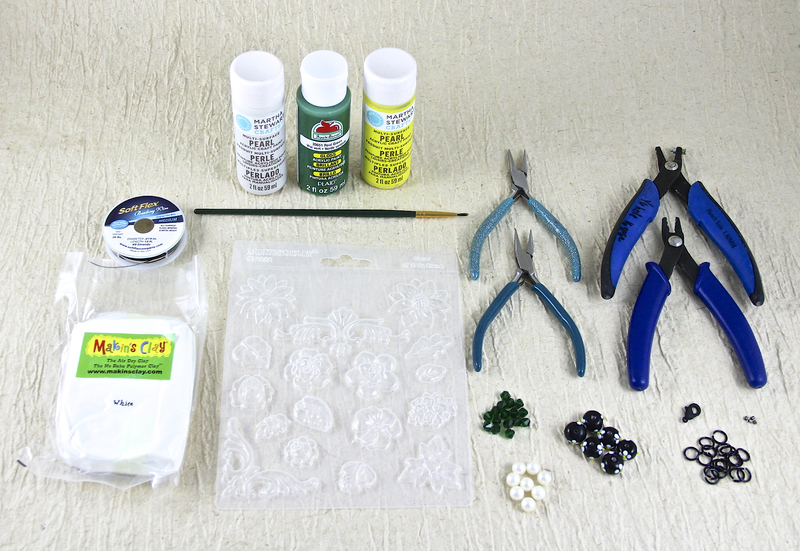 Apply the rhinestone sticker sheet circles to the clay pieces by removing the backing of the sticker sheets. 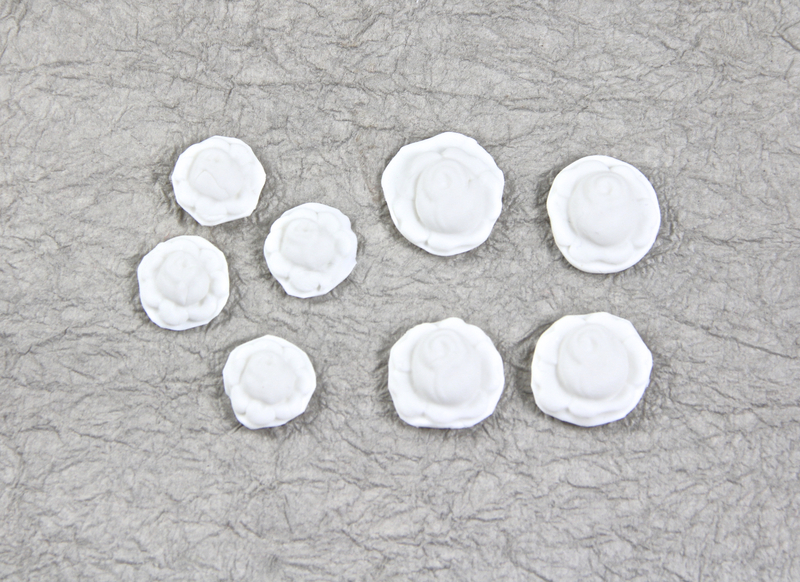 Trim any overlapping sticker sheet from around your clay circles. 5. On the top of your big circle, make a hole using your hole punch pliers. On the rest of your circles, make a hole at the top and bottom. 6. 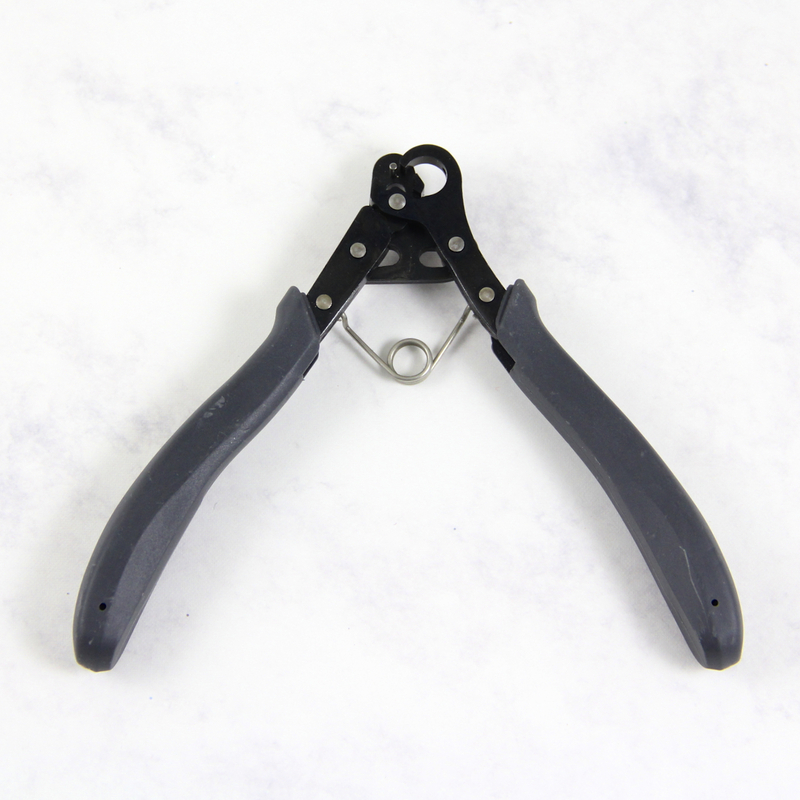 Using your flat nose and chain nose pliers, open one jump ring. Slip one half of your jump ring through the bottom hole of one of your larger lip circles. Hook the other half of the jump ring through a circle link. Close your jump ring. 7. Repeat step 6 with the top hole of your larger lip circle. 8. Connect the bottom of medium pink diamond circle using a jump ring to the top circle link of the larger lip circle. 9. Continue linking your circle pieces together as shown in the picture above. 10. At the top of your chain of circle pieces, attach three circle links with jump rings. Please make sure to hop on through and stop by these other blogs to see what others have made using Marisa Pawelko’s Rhinstone Sticker Sheets! Hello Beadphoria Friends! 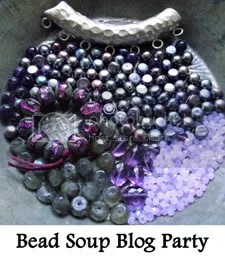 I know that we usually talk about beading and jewelry making on this blog, but sometimes it can be nice to stretch our creative wings and try another craft, especially if it is another way to adorn your neck. The book Creative Scarves by Tiffany Winsor, Heidi Borchers, and Savannah Starr is full of 20+ different styles that range from easy to difficult. I liked the fact that they included some designs using pre-made scarfs that are altered, for those of us that may not be proficient in sewing. 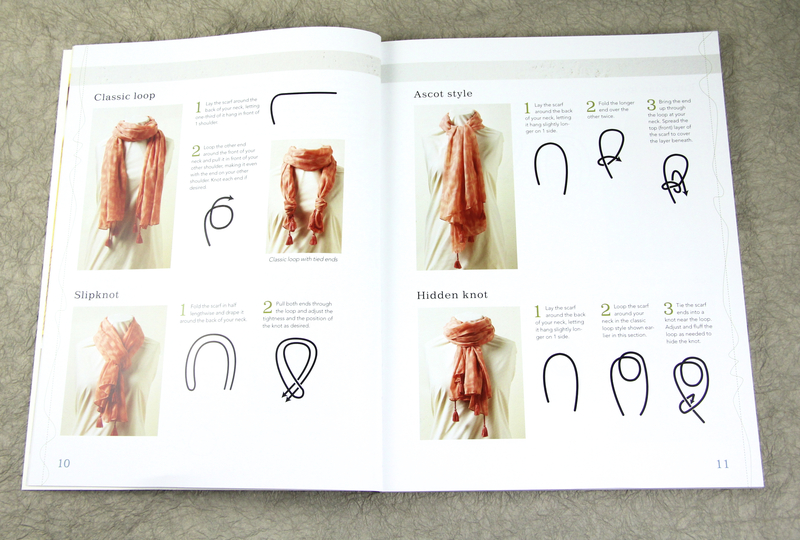 One of my favorite features of the book is that there is a whole section just on how to tie the scarfs. How cool is that?! There are also several projects that do include beads. 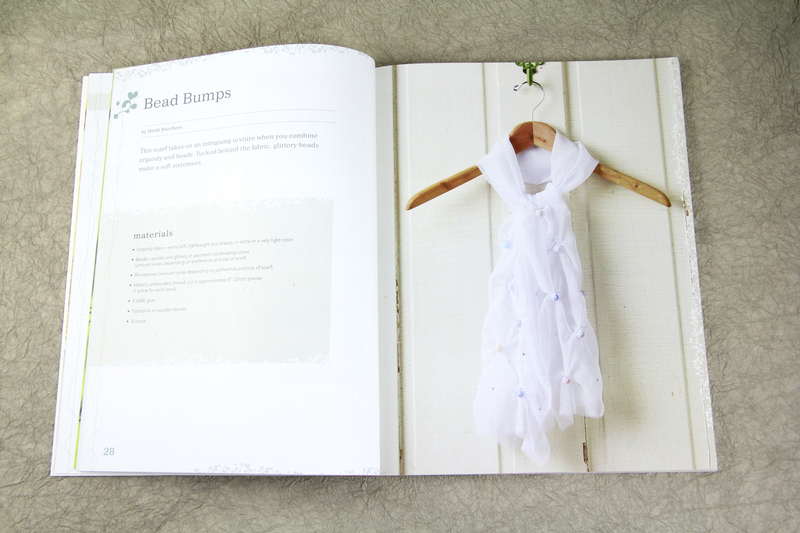 Bead Bumps uses organza fabric, beads, and rhinestones to make a flowing bedazzled scarf. Fancy Yarns uses large hole beads to complete the look of this easy to make yarn scarf. The book is nicely divided into seasons, but you will find yourself inspired to create a scarf no matter what time of the year it is. 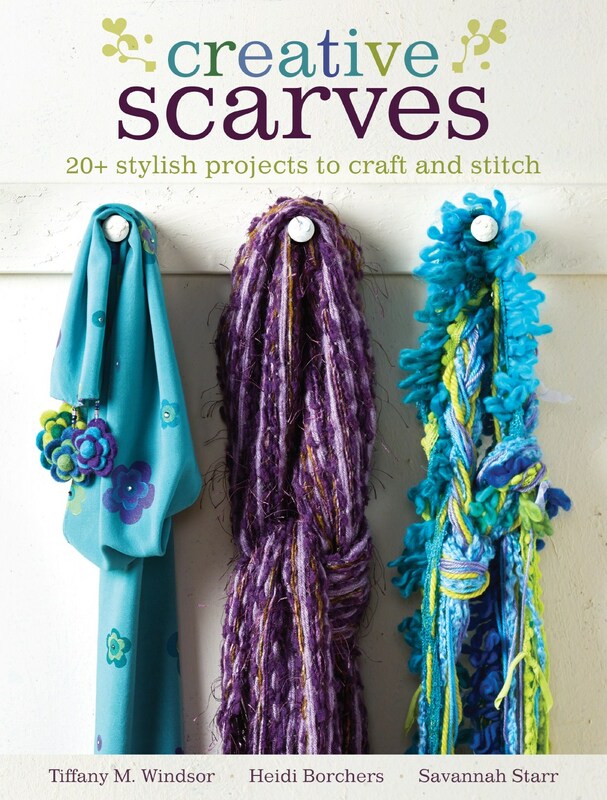 After reading this book, I would highly recommend it to anyone looking to try scarf making, or those looking for some new ideas when it comes to scarfs. To celebrate the book, Tiffany Winsor is giving away a signed copy of the book and a $100 gift certificate to Dharma Trading to start your creative journey! You can enter here. Also, click the button below to see what other have created from the book. Welcome to the Beadphoria Blog, my creative friends! Today the talented artists of the Designer Crafts Connection are showing what they can create with Connie Crystal crystal sheet. 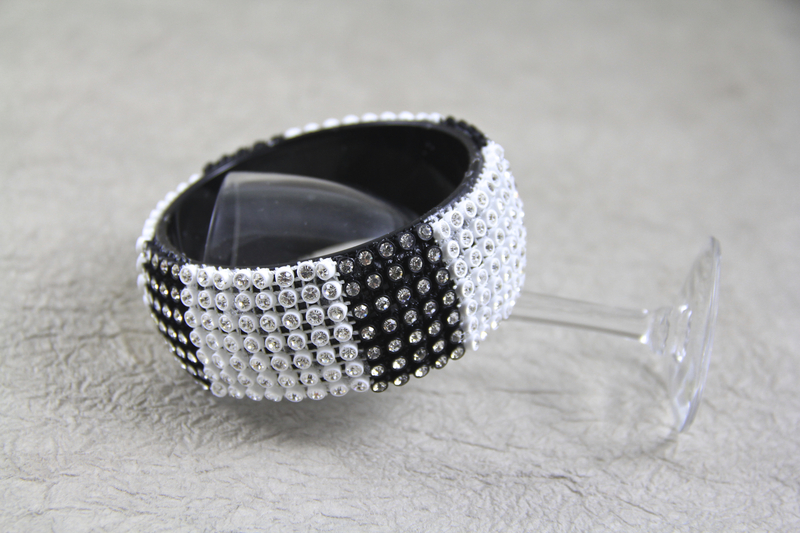 The crystal sheet comes in two colors, black and white. 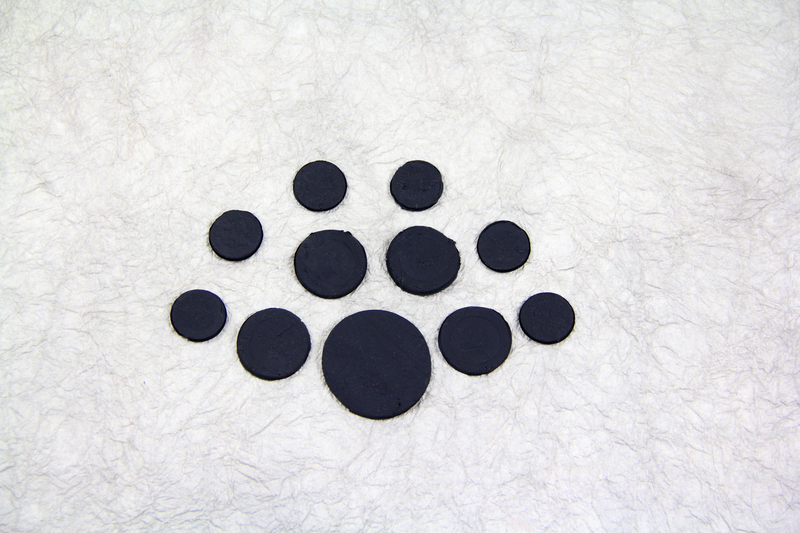 The sheets give off a great sparkle that would look great in many different jewelry projects. What I liked about it was that the sheet was very flexible, so it molded to the shape of the bracelet quite easily. It was also easy to cut with ordinary scissors. I decided that I wanted to give my bracelet a little pop of color, so I created the roses using white Makin’s Clay. I loved the fact that the clay is air dry, so no baking or fumes were involved. The roses were then colored with acrylic paint and sealed with a gloss glaze. 1. Using your push mold, create four large roses and four small roses. Allow to dry for 24 hours. 2. While your roses are drying, cut your white crystal sheet 8 rows wide by 7 rows high and your black 5 rows wide by 7 rows high. 3. 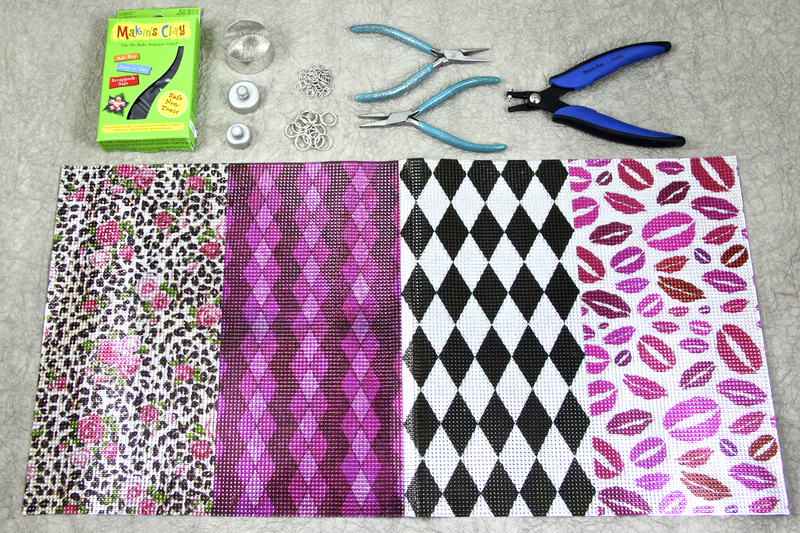 Glue the sheets in an alternating pattern to your bracelet. Allow to dry. 4. Paint the four large roses red and the small roses pink. When dry, apply the clear glossy sealant. 5. When flowers are dry, adhere the red roses to the middle of the white sections and the pink roses the middle of the black sections. I hope you enjoyed my Diamond and Roses bracelet. Let me know what you think in the comments above. Make sure to hop through using the Designer Crafts Connection button on the left hand side of this blog to see what other sparking creations are being made with Connie Crystal crystal sheet. Welcome to the Offray Ribbon Blog Hop! When I heard about the opportunity to work with Offray Ribbon for this challenge, I jumped at the chance! I had used Offray ribbon in the past on a few of my other pieces and had always enjoyed the quality of their material. For this challenge, I was sent ribbon in vibrant yellow and orange. I knew that I wanted to create something that was as bold as the colors that I was given. The beads were all purchased at Micheal’s, and matched perfectly with the ribbon. I decided to call this one “Sunshine” to bring a little bit of brightness to the cold and gloomy weather we have been having here in Chicago. 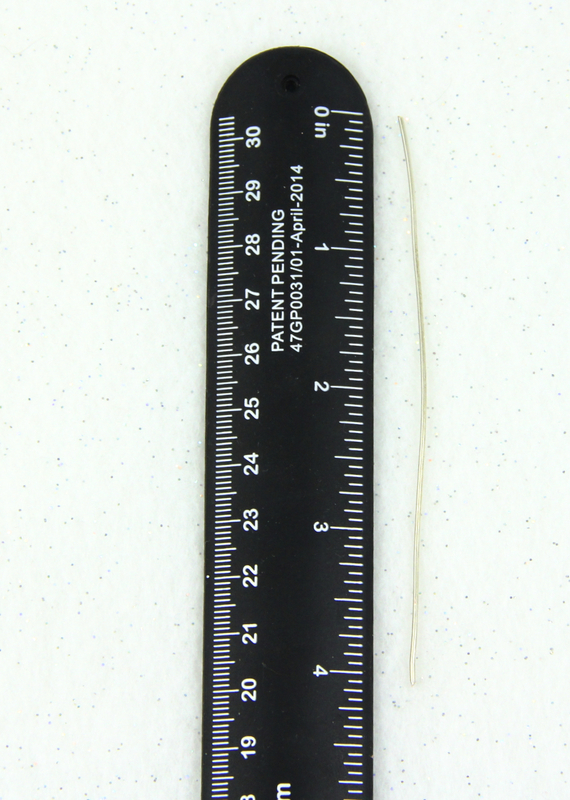 One of the biggest challenges we have as jewelry designers is determining the length of a necklace. By using ribbon, you can easily adjust the length to look good with almost any neckline. For this design, you can even braid the three strands together to get a totally different look. Design Tip: Add a drop of glue or clear nail polish to the knots attached to the connector to make sure they stay secure. Make sure you stop by the Offray web site. There you can sign up for Offray.com email newsletters to receive information about new products, project ideas, and special savings. Plus, receive 15% Off your first order at Offray.com when you sign up for email. Click through on the Designer Crafts Connection logo to the left of this blog to see what the other talented designers made with Offray ribbon. 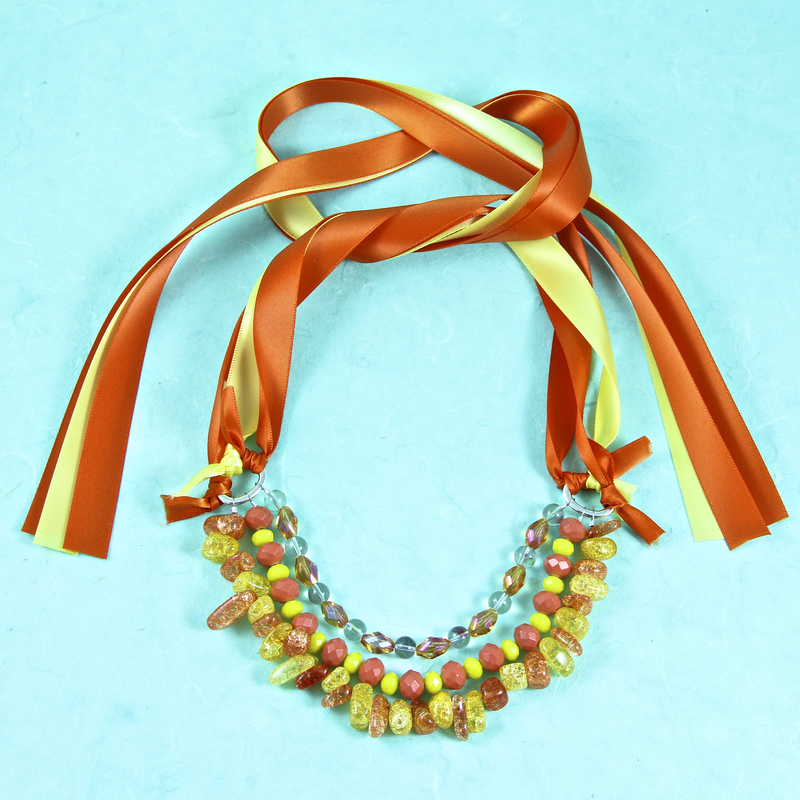 What do you think of the Sunshine Ribbon Necklace? Have you used ribbon in your jewelry designs? Let me know in the comments at the top of this post! Happy 2015, my creative friends! For today’s post, we are to feature our favorite tool or technique of 2014. The tool that I have fallen in love with the past year has to be the 1 Step Looper from BeadSmith. 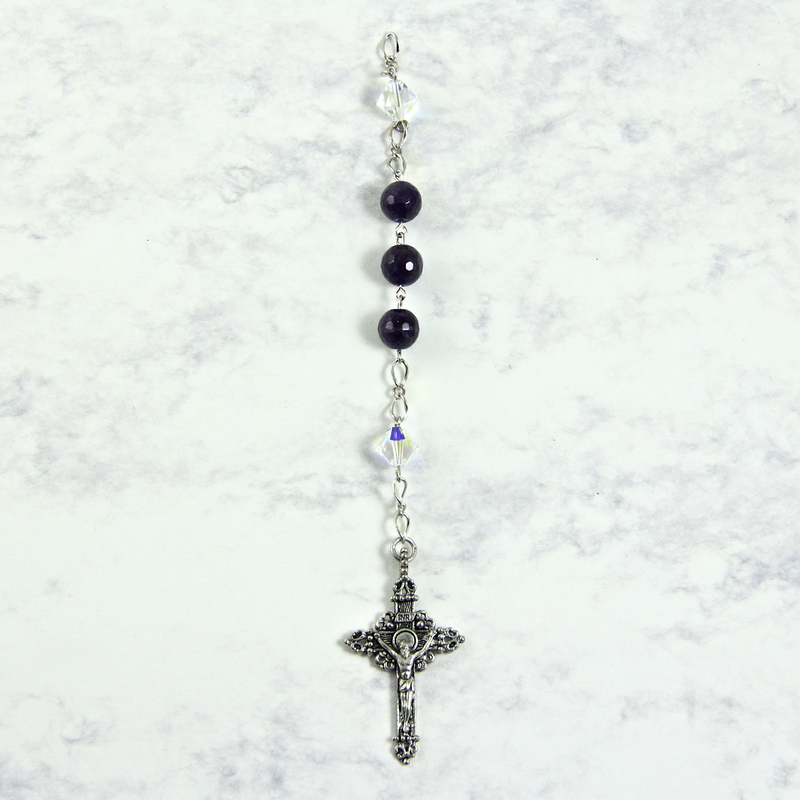 Recently, I was commissioned to make a rosary for a client. I knew that this was the perfect situation for my 1 Step Looper. By using the 1 Step Looper, I probably cut my time to make the rosary in at least half. 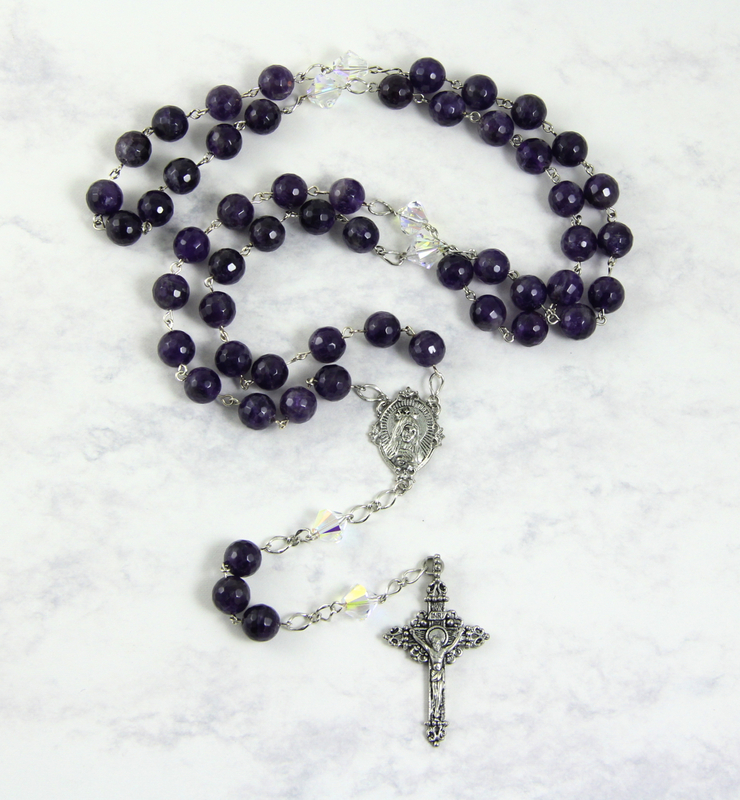 The rosary was to be a gift for a very important person in their lives, so I decided to use some outstanding grade A amethyst that was faceted for the “Hail Mary” beads. I also used clear AB Swarovski Crystals for the “Our Father” sections to make it extra special. 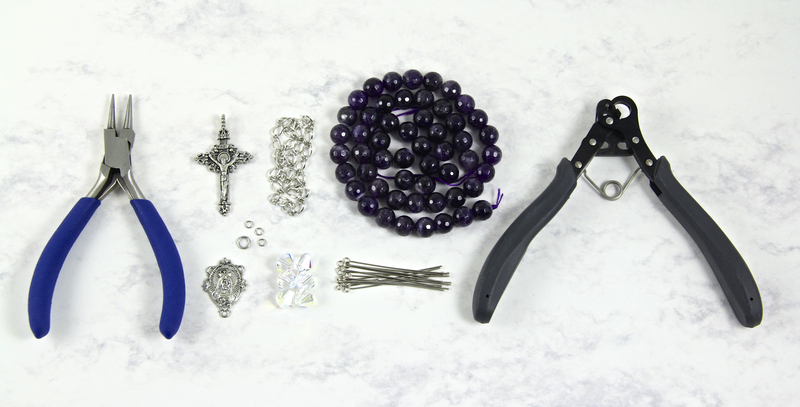 Here is how to make your own rosary. 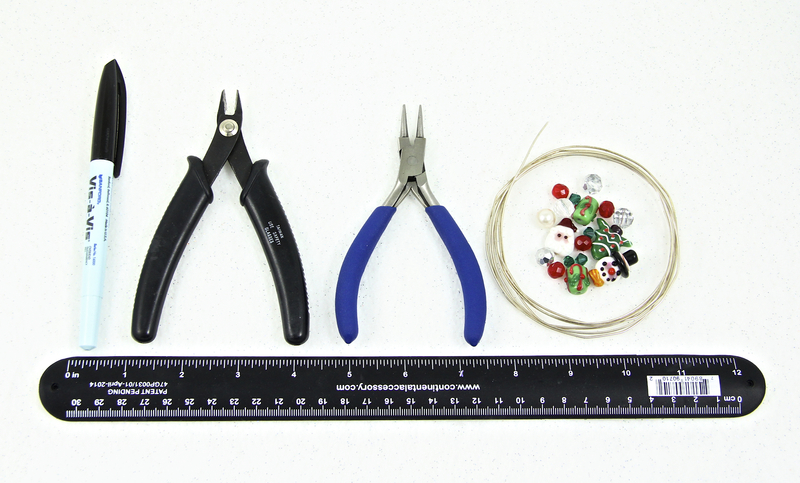 Tools to make a rosary. 1. Insert eye pin into 1 amethyst bead. 2. 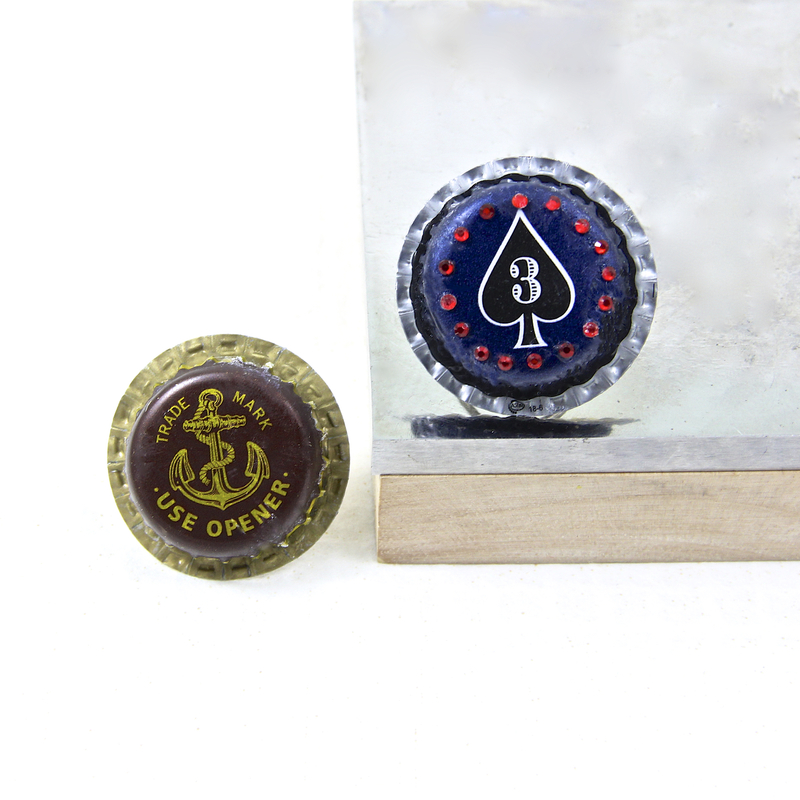 Using your 1 Step Looper, create a loop at the opposite end of your eye pin. 3. 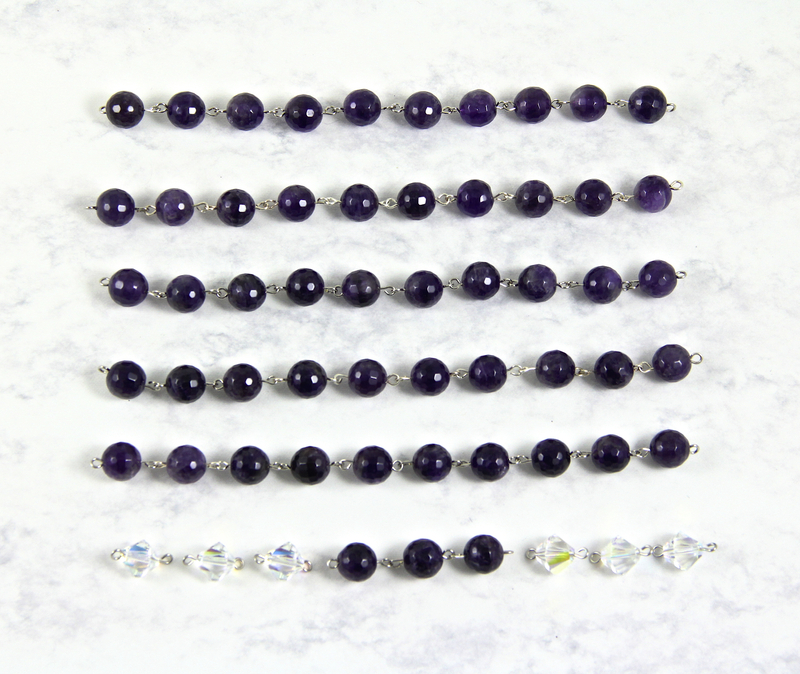 Repeat steps 1 and 2 for all your amethyst beads and the Swarovski crystals. 4. 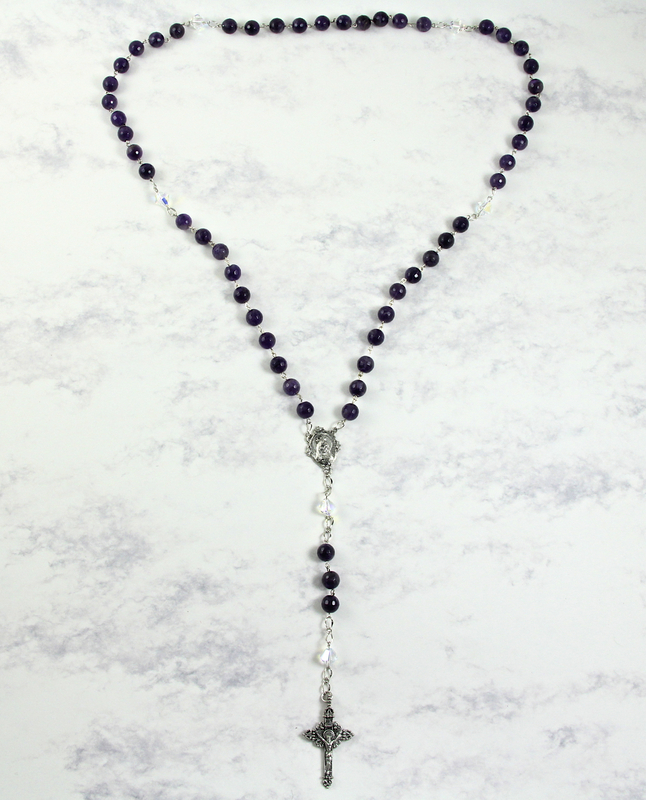 Link your amethyst beads together using your round nose pliers. Make 5 sections of 10 beads and one section of 3 beads. 5. 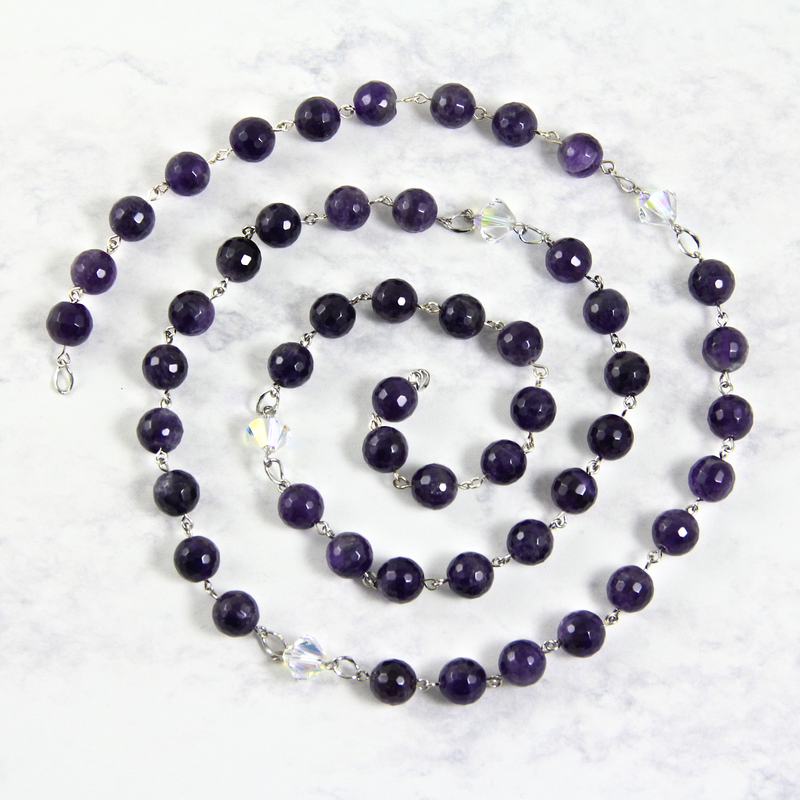 Join together a section of 10 amethyst beads, one link of silver chain, one Swarovski crystal, one link of silver chain, and another section of 10 amethyst beads. Do this until all the sections of 10 amethyst beads are connected. Add one link of silver chain to both ends of the chain you just created. 6. To create the center chain, link together 3 links of silver chain, one Swarovski crystal, 3 links of silver chain, the section of 3 amethyst beads, 3 links of silver chain, one Swarovski crystal, and 3 links of silver chain. Attach the cross to the bottom of the chain you made using your 5mm jump ring. 7. Connect the ends of your long piece of chain to the top two circles of your center piece using 2 of the 3mm jump rings and connect the piece with the cross to the bottom circle of the center piece using the last 3mm jump ring. 8. (optional) Go through your rosary with your round nose pliers and make sure all your connections are tightly closed. I hope you enjoyed this tutorial. Let me know in the comments above what you would make with a 1 Step Looper, or if you have one, what projects you have make. Here’s to wishing you a New Year filled with creativity, joy, peace, prosperity, and lots and lots of beads! Welcome to the Smoothfoam Holiday Ball Blog Hop! 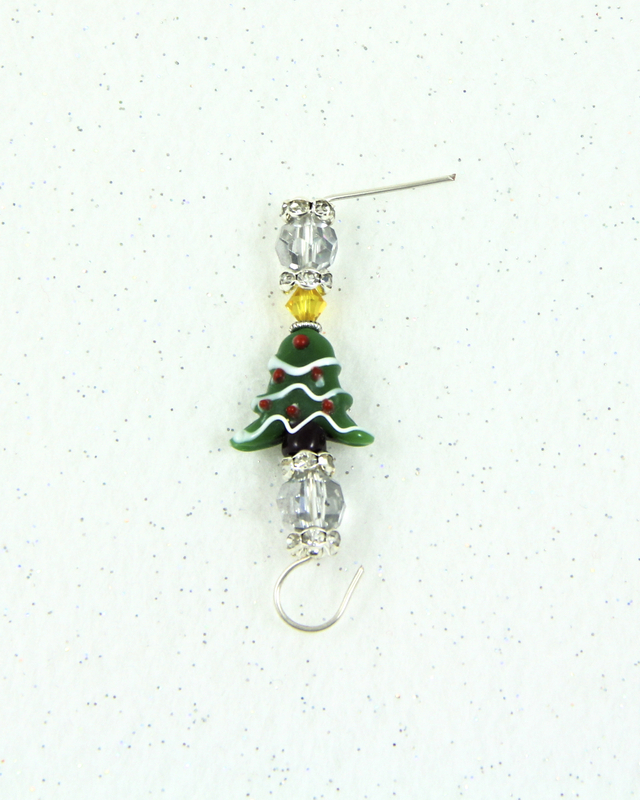 Today’s project is a stunning ornament that you will want to leave out all year long. 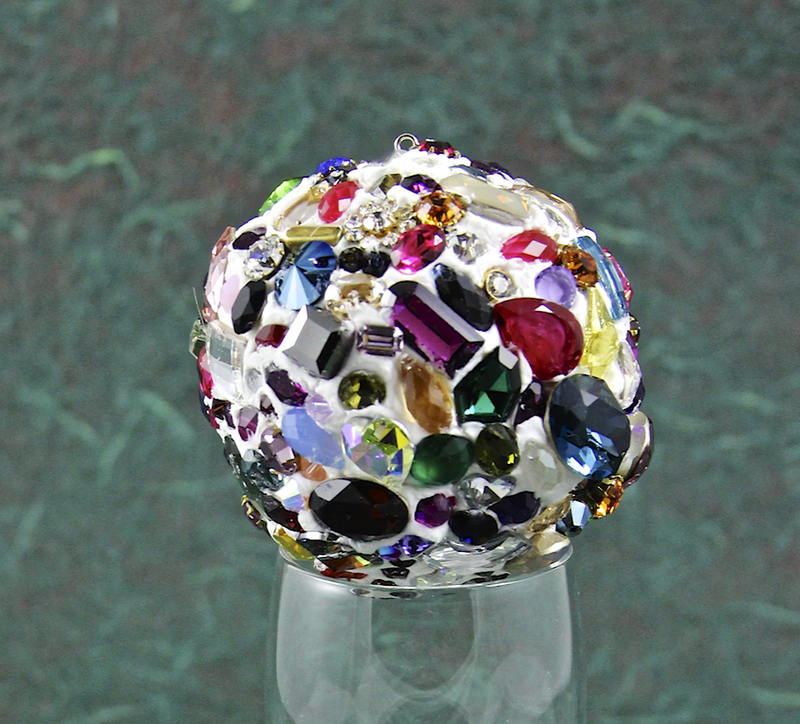 The Swarovski Crystal Mosaic ornament is sure to bring lots of sparkle to your tree. The Smoothfoam 2 inch ball was used as the base of the project. Having something light weight to counteract the weight of the crystals was very helpful. I covered the ball using Mod Podge’s Collage Clay for the medium to hold the crystals. This project took me about a hour, so not too bad time wise. 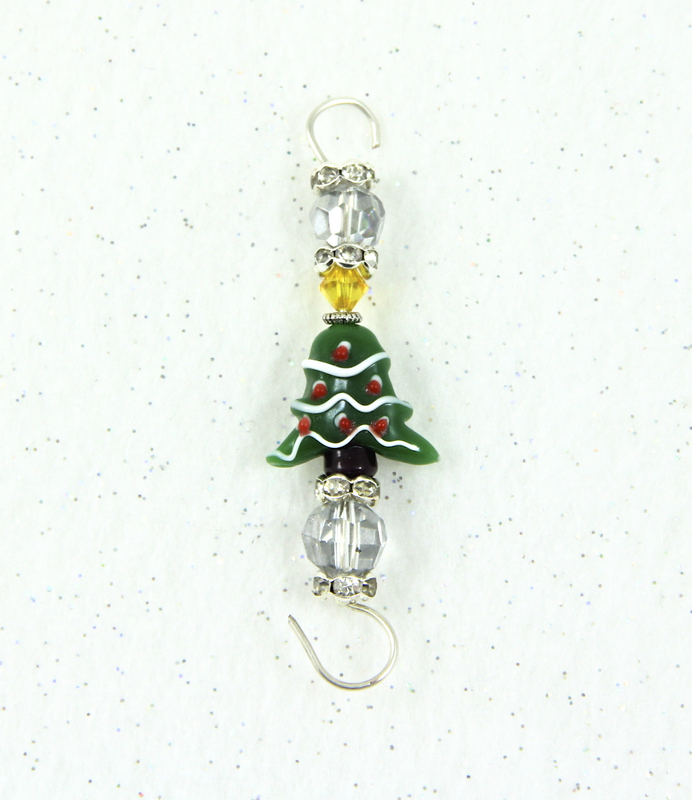 You could also make this from left over beads in your stash. 1. Insert eye pin into the top of the Smoothfoam ball. 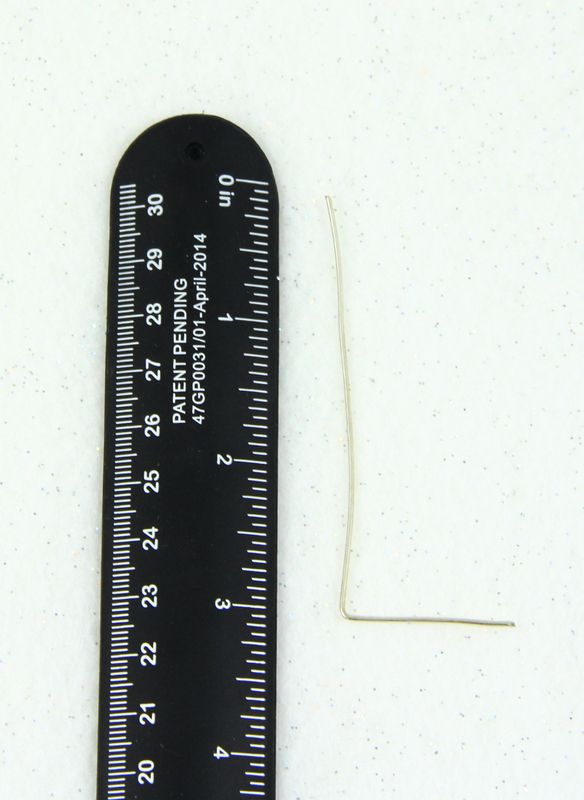 Leave 1/4 inch of the top of the eye pin exposed. Tip: You might want to add some glue to your eye pin to make sure it stays in place. 2. 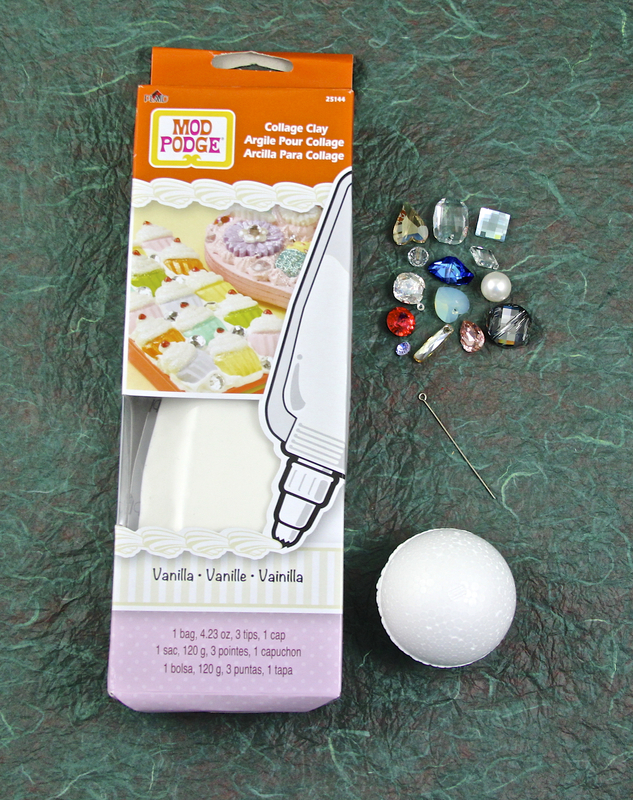 Using the Wavy tip, apply a section of Mod Podge Collage Clay to your Smoothfoam ball. 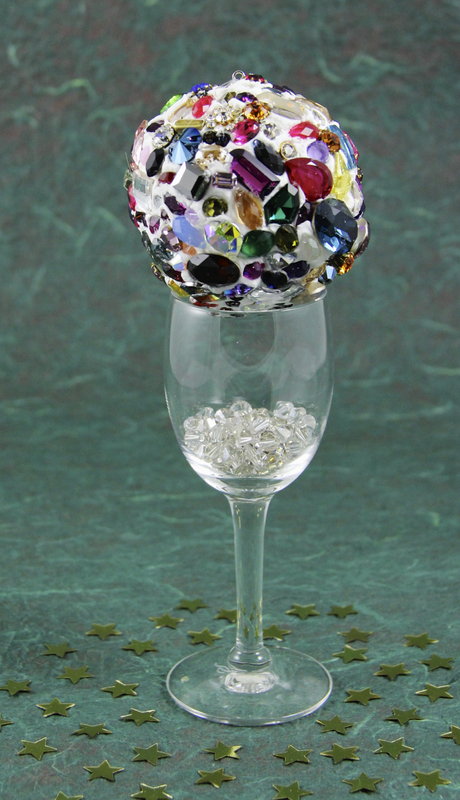 Tip: Use a small glass or candle holder to hold your ball while your are applying the Mod Podge Collage Clay and crystals. 3. 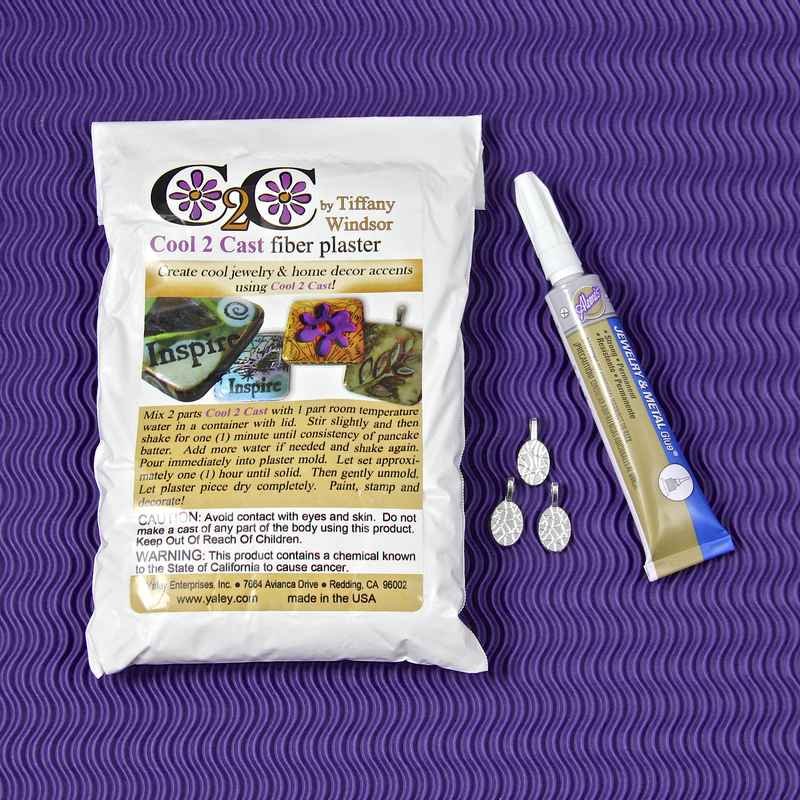 Apply crystals to your Mod Podge Collage Clay. 4. Repeat steps 2 and 3 until the whole Smoothfoam ball is covered. 5. Allow ornament to dry for 24 hours. 6. 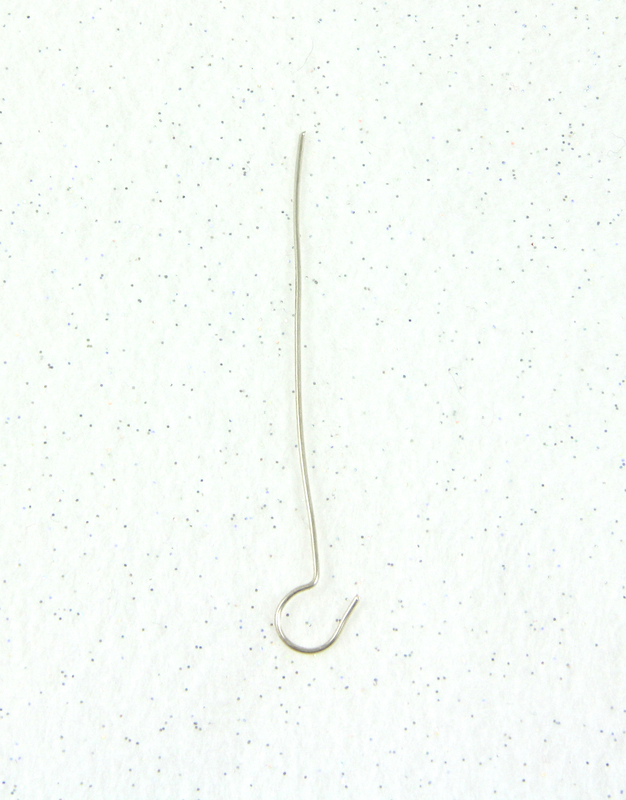 Put some string through your eye pin and tie it to form a loop. 7. Hang your ornament on the tree and enjoy! Don’t forget to hop through and see all the other wonderful creations made with Smoothfoam balls! You can click here to see them! Welcome to December, my creative friends! If you haven’t already, it’s time to start decorating for the holidays. 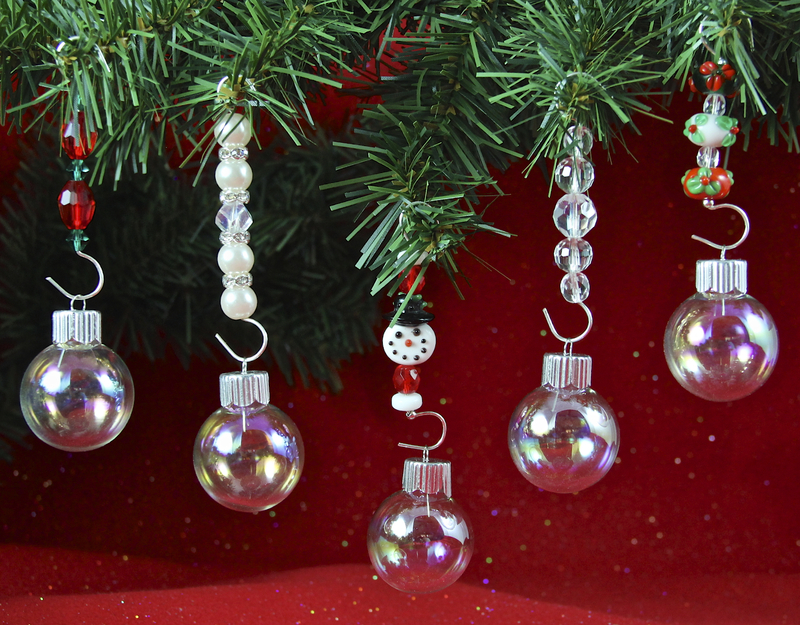 Today’s project is super easy and a great way to make your tree more festive – beaded ornament hangers. I came up with this idea when I noticed how boring traditional hangers look. Anyways, who doesn’t love some extra sparkle for their tree! Close up of ornament hangers. 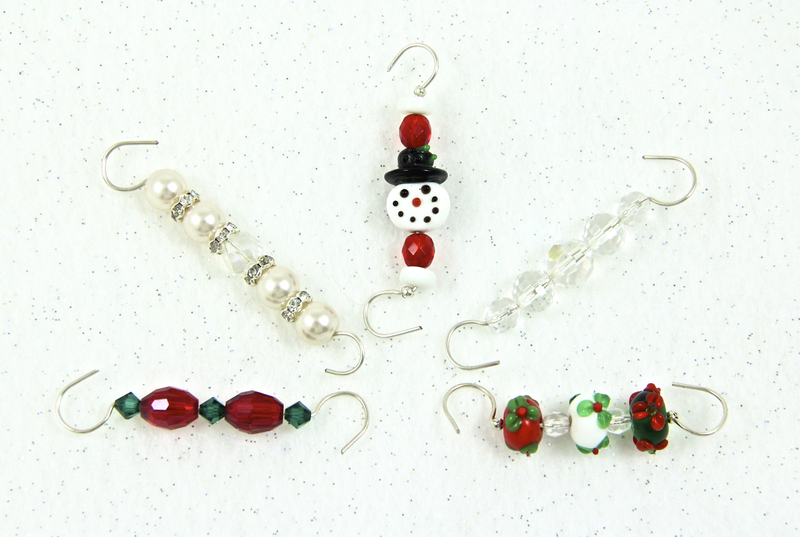 As you can see, you can make the hangers sophisticated looking with crystals or pearls, or you could go for a more whimsical look with lampwork Christmas beads. 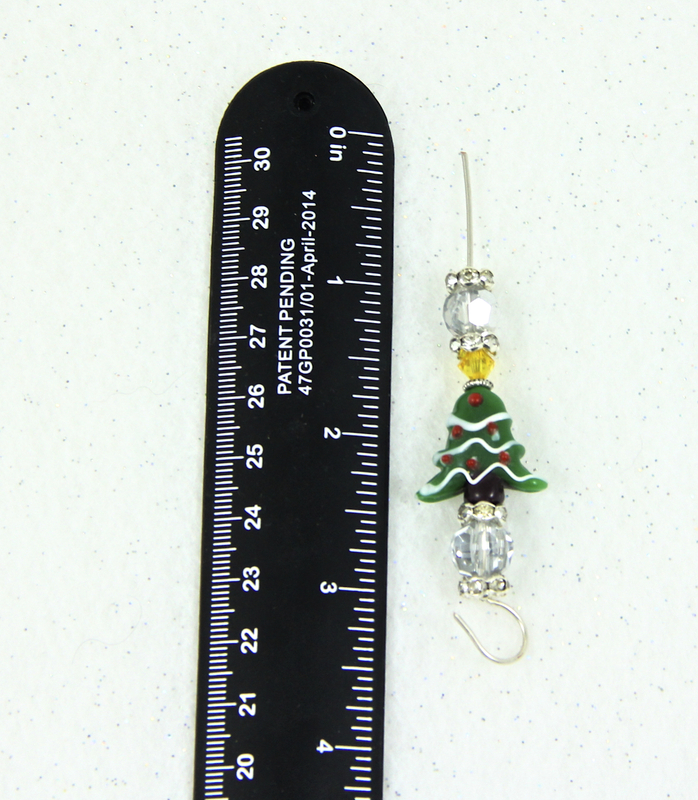 You could also make them to match a color scheme of an overall tree or a particular ornament. 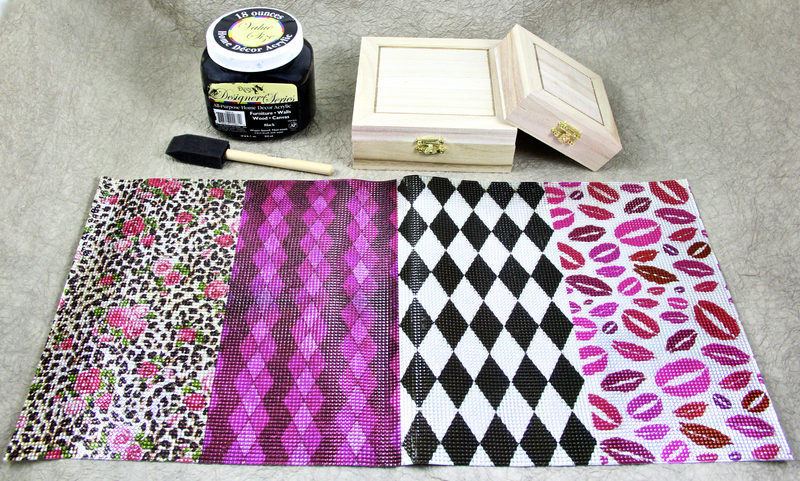 This project is also good for using up beads that you might have in your stash. 1. Cut your wire into 4 inch strips. 2. Make a 90 degree angle three inches from the top of your wire. 3.Wrap the bent wire around the barrel of the pen to form the hook at the bottom of the hanger. 4. Place approximately 2 inches of beads onto your wire. 5. Make a 90 angle with the top inch of your wire going in the opposite direction of the one on the bottom of your hanger. 6. Curl the top inch of your wire around your pen to make the top hook. 7. Place your ornament on the bottom of your hanger and place on tree. So what kind of ornament hangers would you make? Sophisticated or whimsical? Is there one particular ornament hanger that I made that you liked? Let me know in the comments! Welcome back, Beadphoria friends! 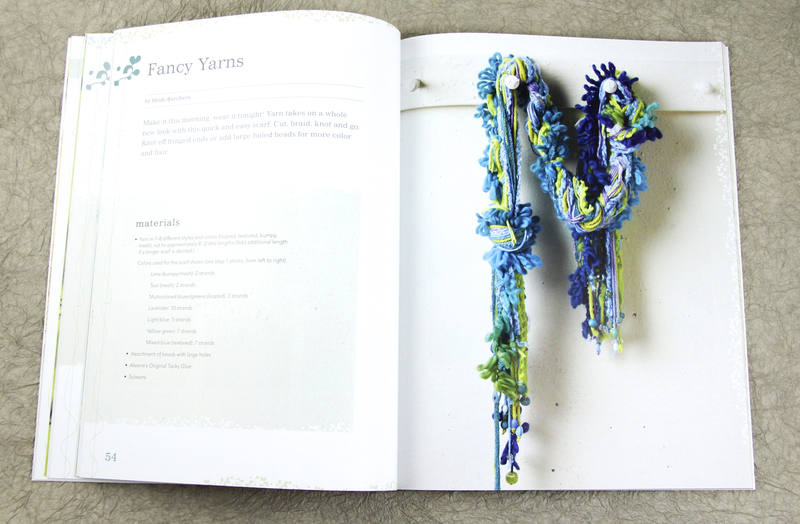 How many times have you looked at objects laying around your home or headed for the trash and wondered, “There has to be another way I could use this.” Today I would like to introduce you to a new book that will have you looking at your recycling bin in a whole new way – Upcycled Jewelry, Bags, Belts, and more by Linda Peterson. 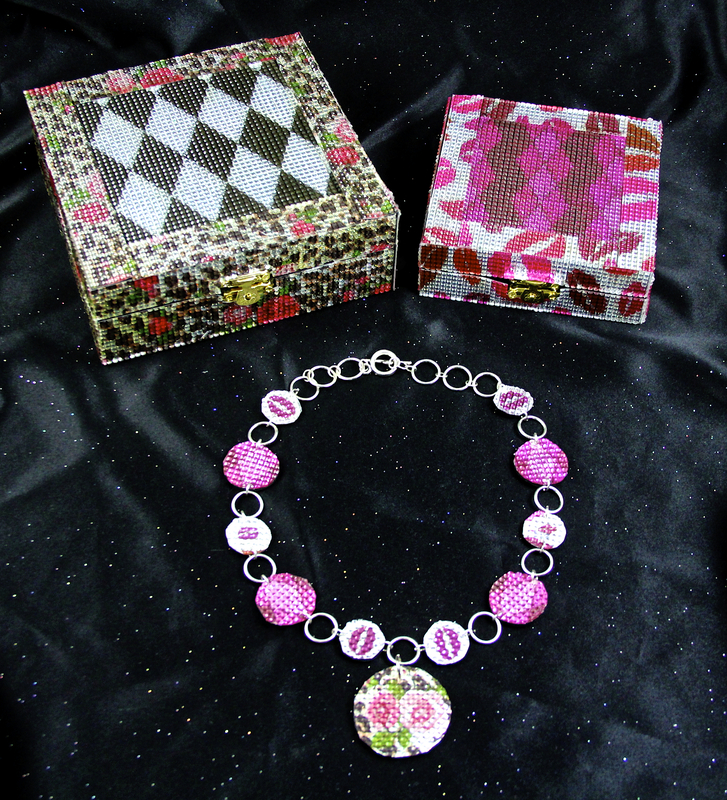 Upcycled Jewelry by Linda Peterson features 35 projects that range in difficulty from beginner to advanced. There are several interesting techniques used in the book, including how to melt plastic and re-purposing old bicycle tubes for jewelry components. 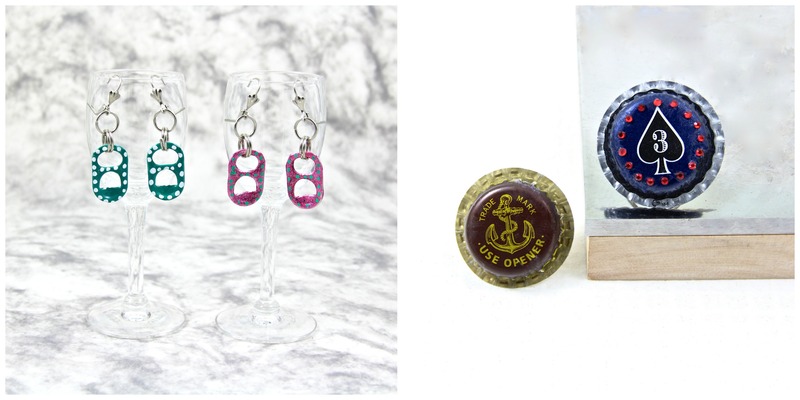 The two projects I decided to try were the Pretty Polk Dot Earrings and the Bottle Cap Ring. I chose these projects because I loved how simply the pop tops were altered and I have always had a thing for rings. As you can see, the materials needed for the Pretty Polka Dot Earrings are, except for the paint pens, common house hold objects. The only tools that you need are two pairs of pliers to open and close the jump rings. The finished Pretty Polk Dot Earring turned out really cute. They were quick to make, with the longest part of the process being waiting for the nail polish to dry. The only tip I would give is to use opaque nail polish or to make sure you apply a second coat to fully cover the metal. 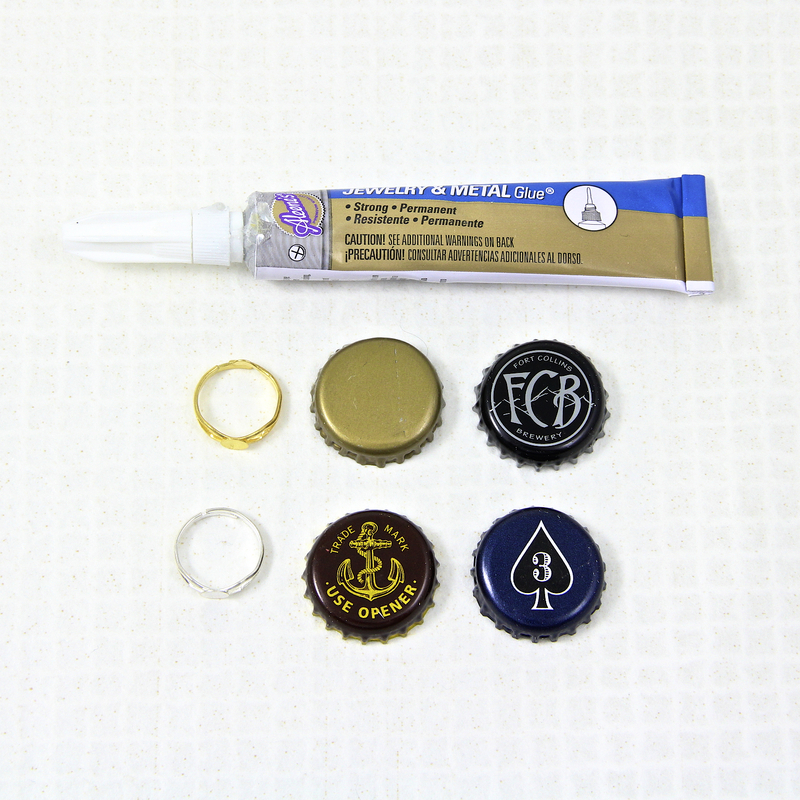 The materials for the Bottle Cap Ring is bottle caps, ring blanks, and a strong adhesive. The book recommends a silicone adhesive, but I used jewelry glue instead with the results being just fine. For tools, you will need a hammer and bench block to pound your bottle caps on. I was very happy with how my finished rings turned out. For the brown one, I liked the phrasing on it so much, that I decided to not add anything. For the blue one, I wanted some extra bling, so I added a few Swarovski crystals on the outside. 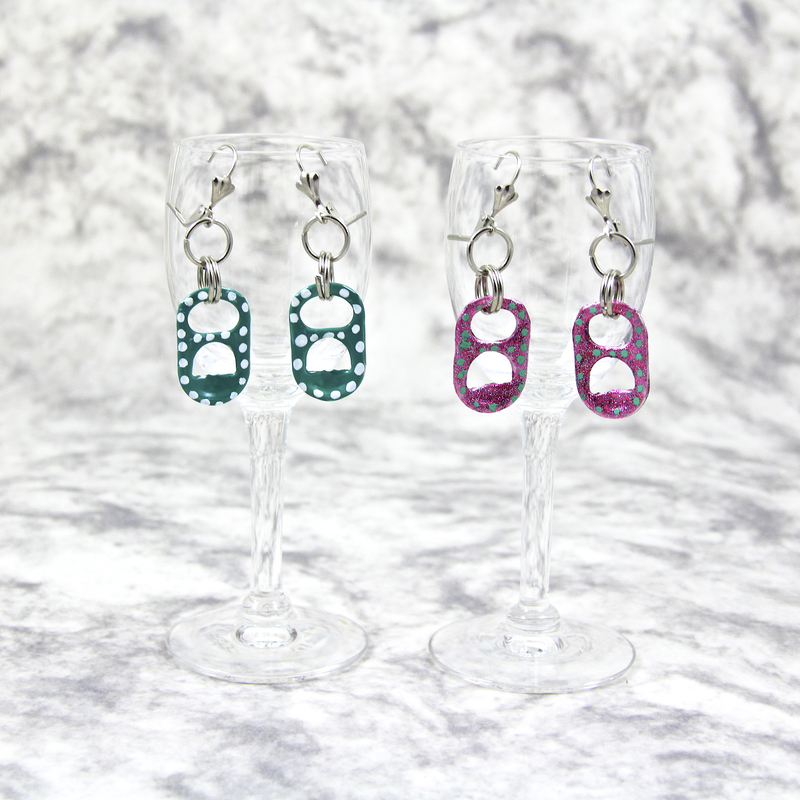 Another idea would be to use the same nail polish technique used in the Pretty Polka Dot Earrings and alter your bottle caps that way. The book contains lots of step by step photos, which is helpful when you are learning new techniques. A few of the projects required skills such as riveting and sewing, so there is something to interest for just about everyone. 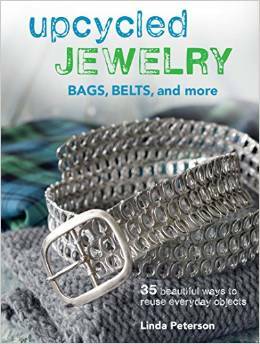 If you are looking to expand your jewelry making skills and help save the planet at the same time, make sure to pick up a copy of Linda Peterson’s Upcycled Jewelry, Bags, Belts, and More. 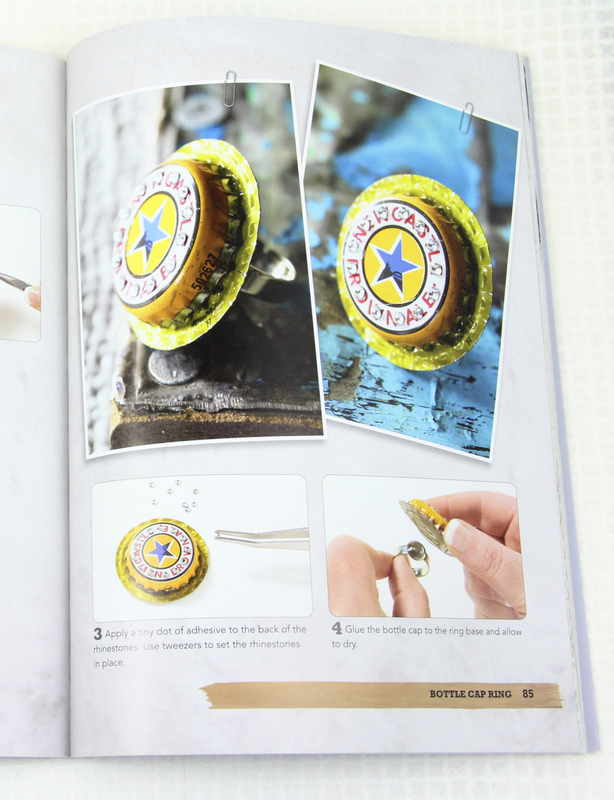 Which project did you like better, the Pretty Polka Dot Earrings or the Bottle Cap Rings? Which one of these might you try? Let me know in the comments above! Click here to find all the other blogs participating in the hop! Welcome, my creative friends! 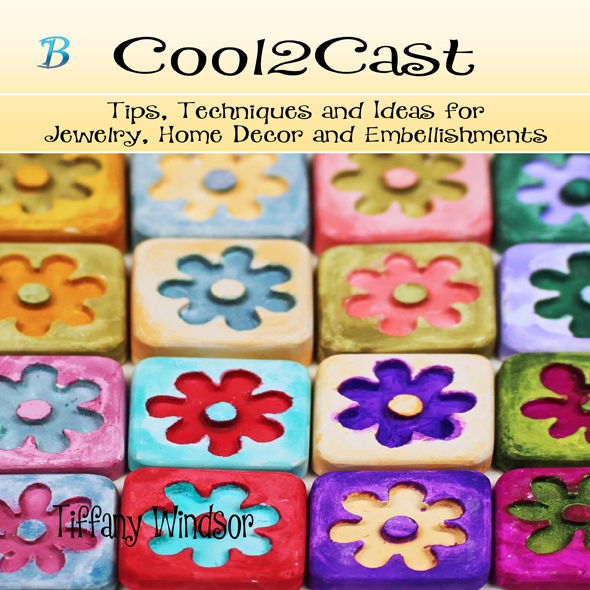 Recently, my colleagues at Bella Crafts Quarterly asked me to review their new e-book Cool 2 Cast -Tips, Techniques, and Ideas for Jewelry, Home Decor, and Embellishments. I was also sent a sample of Cool 2 Cast to try out. 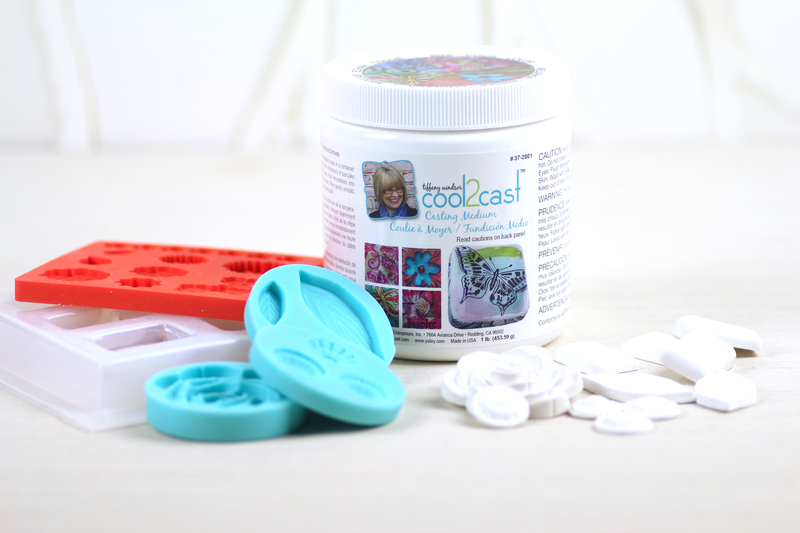 For those of you not familiar with Cool 2 Cast, this medium is a must try for jewelry makers. 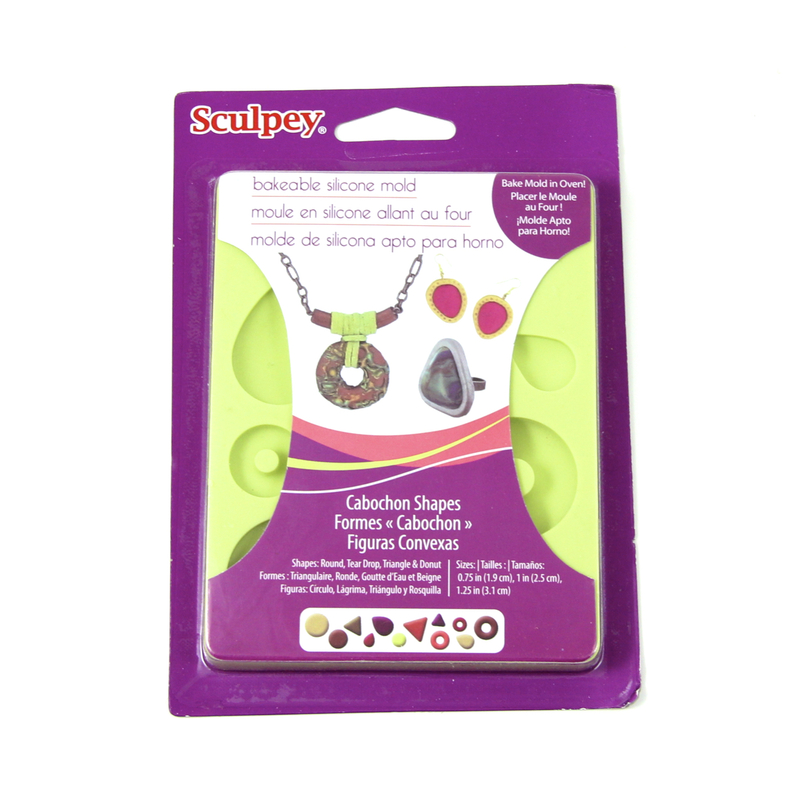 Cool 2 Cast allows you to make your own pendents and embellishments from molds or free form from texture plates or rubber stamps. It has a texture similar to plaster, but much more lightweight. 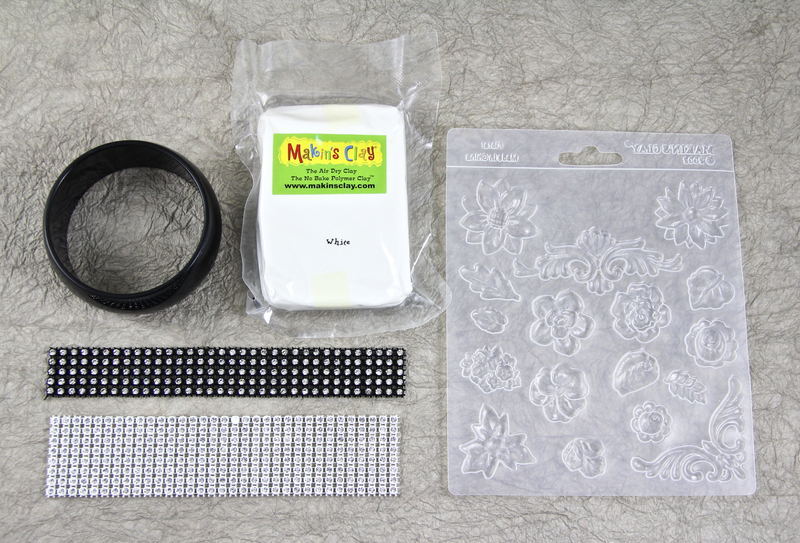 Some of the materials you will need to create Cool 2 Cast pendants. Since I had never used Cool 2 Cast before, I was heavily relying on the instructions in the Cool 2 Cast e-book. I am happy to tell you that the instructions were very well written with lots of photographs for the steps. The book also includes lots of inspiration with numerous projects included. 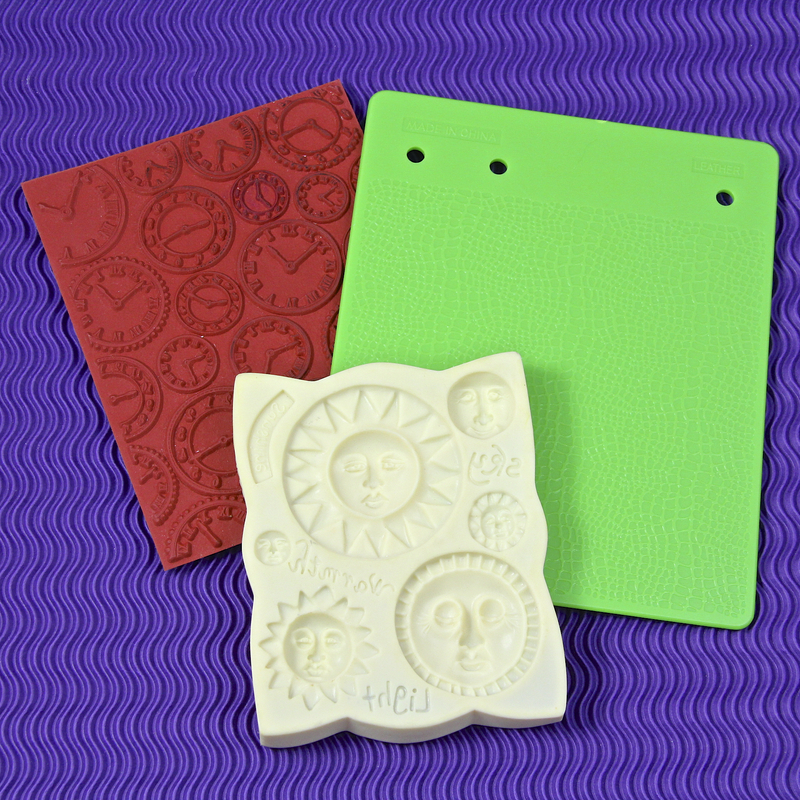 Examples of large stamps, texture plates, and silicone molds you can use with Cool 2 Cast. I decided I wanted to try my hand at making some pendants. From the book, I knew that I would need the Cool 2 Cast, silicone molds and a large sheet rubber stamp, bails, jewelry glue, some sand paper, paint and possibly a few embellishments. 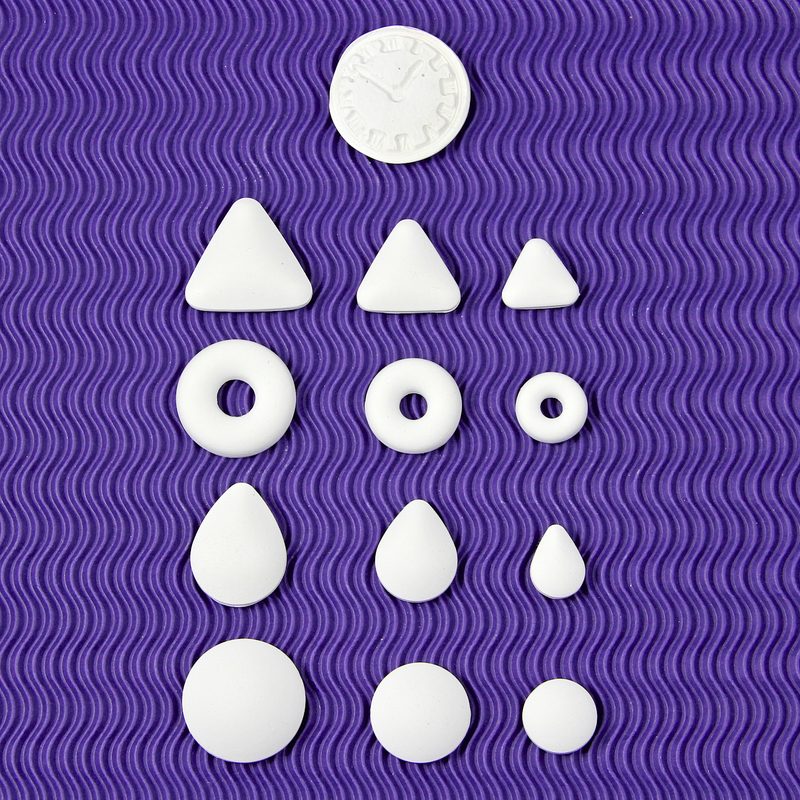 The mold that I decided to use is a new one from Sculpey called Cabochon Shapes. I really like it. It gives you four different shapes in three different sizes. I also decided to use the clock rubber stamp from above to try a little free form molding. I let my Cool 2 Cast sit for and hour and then released them from the molds. Then cleaned them up with 220 grit sand paper. As you can see, the results turned out very nice. 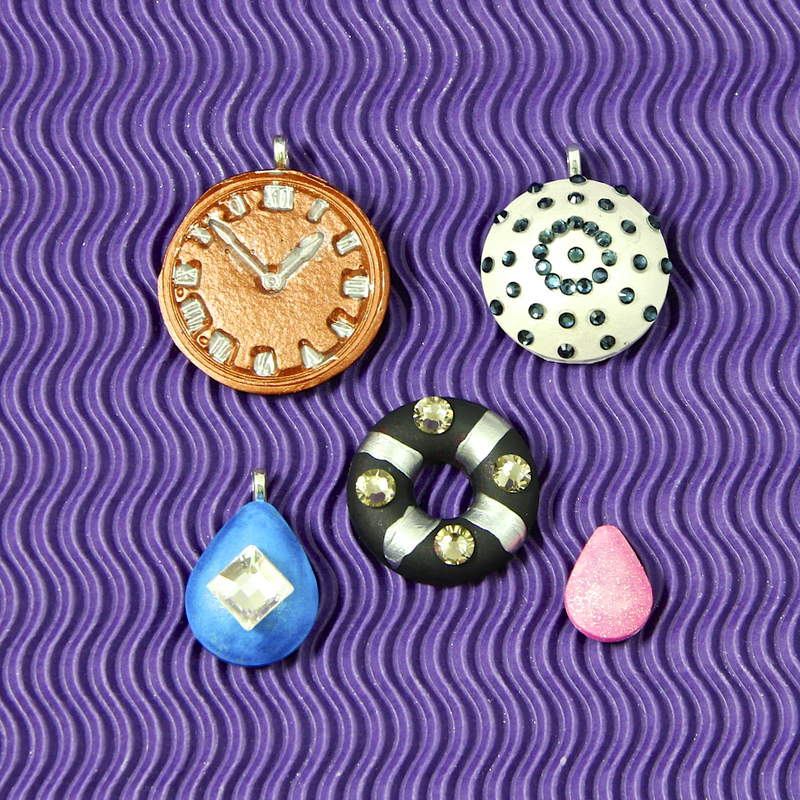 Here are a few of the samples of the finished pendents. I decided to make the clock into something with a steampunk theme. On three of the other ones, I decided to add Swarovski embellishments, because, well, who doesn’t like a little extra bling?! The little pink one was made with pink glitter paint. I might turn that one into a ring. If you would like to order your own copy of the Cool 2 Cast e-book to create your own custom jewelry pieces, click here. You can see a list of blogs featuring other Cool 2 Cast and find out how to win your own starter set of Cool 2 Cast by clicking here. What would you create with Cool 2 Cast? Is there one of the pendants that I created that you like best? Let me know in the comments! 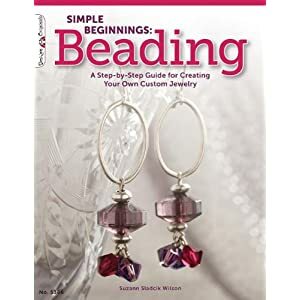 Buy Simple Beginnings: Beading Now! Learn How to Solder! 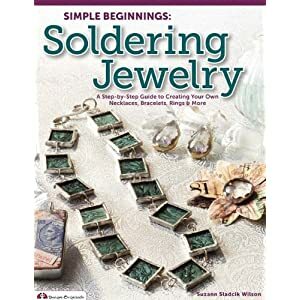 Order Simple Beginnings: Soldering Now! Join Beadphoria On Pinterest for Jewelry and Color Inspiration! Have Beadphoria Teach You How To Make Jewelry!